During the years I’ve been living in Brooklyn, I’ve seen Industry City, a massive waterfront complex in our borough’s Sunset Park neighborhood, undergo a tremendous metamorphosis. What was formerly known as Bush Terminal, a center for shipping, warehousing and manufacturing, has transformed to a 35-acre urban campus of 16 buildings with maker spaces, galleries and offices . At 6 million square feet, it’s the largest multi-tenant property in the country. It still has a way to go as far as food and entertainment, but there is much to come in the near future. One of the biggest signs that Industry City had officially shifted gears is the exhibit of works by Dutch artist M.C. Escher. I had heard about the exhibit and when I went to look up details, I was surprised to learned it was actually not at a museum, but rather Industry City. Apparently, the location was a particularly apropos venue because Escher was not truly embraced by the art world in his lifetime. With photo booths interspersed with the 200 works (the largest presentation of his works in the U.S), it’s clearly designed as an Instagram-ready destination. 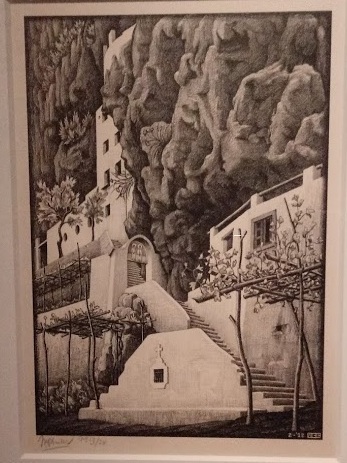 But it gives great context to Escher’s work, in particular documenting his many travels through Europe. Maurits Cornelis Escher (1898-1972) is world renowned for his enigmatic sketches and paradoxical designs executed with incredible detail and mathematic precision to create and construct worlds. He had a natural intuition for mathematical drawings and was captivated by repeating patterns of interlocking tessellations, and the paradoxical representations of infinity. Exploring the intersection between art, mathematics scient and pottery, Escher’s works have fascinated and astounded generations of artist architects, mathematicians, musicians and designers alike. Section 1: Early period and Italy which showed his Art Nouveau pieces. 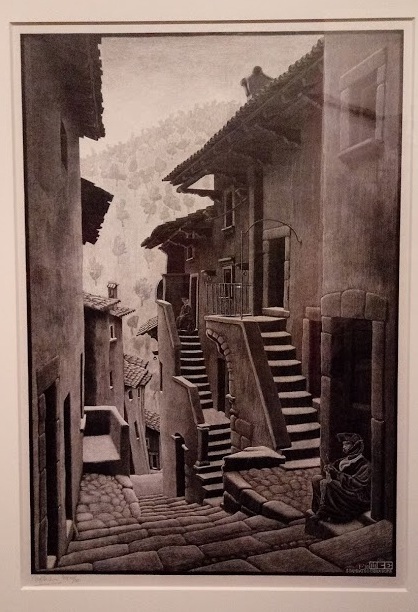 It also took a deep dive into his close relationship with Italy, where Escher spent many years of his life (1921 to 1935), including extended time in Calabria, where my family hails from. Section 2: Tessellation which encompassed his second visit to Alhambra and Cordoba in 1936. It was a turning point in his artistic development, and he began a deep study of the patterns used Moorish palaces. I particularly enjoyed the Moorish tiles and woodcuts, probably due to my love of geometric patterns. I did not find the snakes and similar imagery particularly appealing). Section 5 - The Geometric Paradoxes were quite intriguing, and the interactive photo booth helped demonstrate how the perspective works. Not only was Mathematics a strong influence in Escher’s work, some of his image led to a dialogue with the science world that continued past his death. Section 7 – Eschermania. 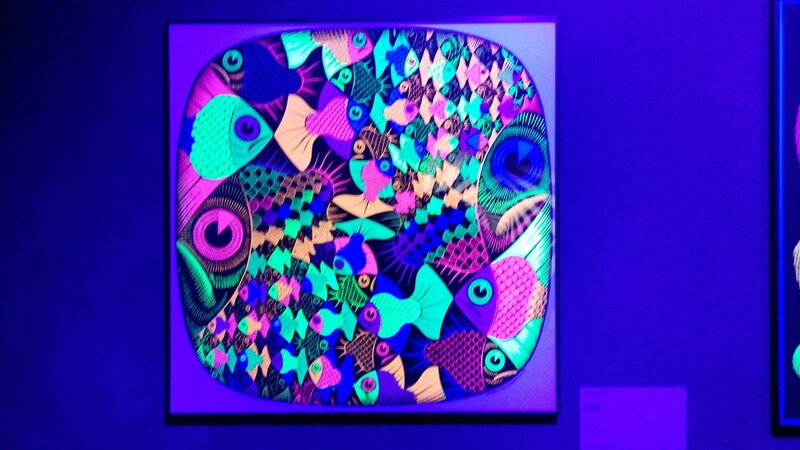 I really like how the exhibit culminated in a display of the many other applications of Escher’s style. 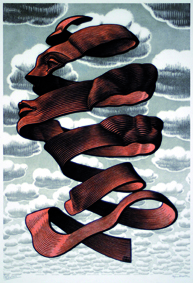 Seeing it on such a broad range of items — gift boxes, postage stamps, greeting cards, comics, cartoons, TV ads and films — really showed the impact Escher’s iconic work has on popular culture through history and continues to the presetnt. Of course, my husband’s favorite part was the album covers, where he proudly commented that his version of Mott the Hoople (from Escher’s Reptiles in 1943) was in much better condition that the one on display. Sandy checking out the vinyl covers in Eschermania. The exhibit, which has been extended a couple times, runs through the end of March at Industry City, 34 34th Street, Building 6 in Brooklyn. Closest subways are the D, N or R to 36th Street.